When Jing Wong puts his mind to things and gets it right, he does so with flying colors. 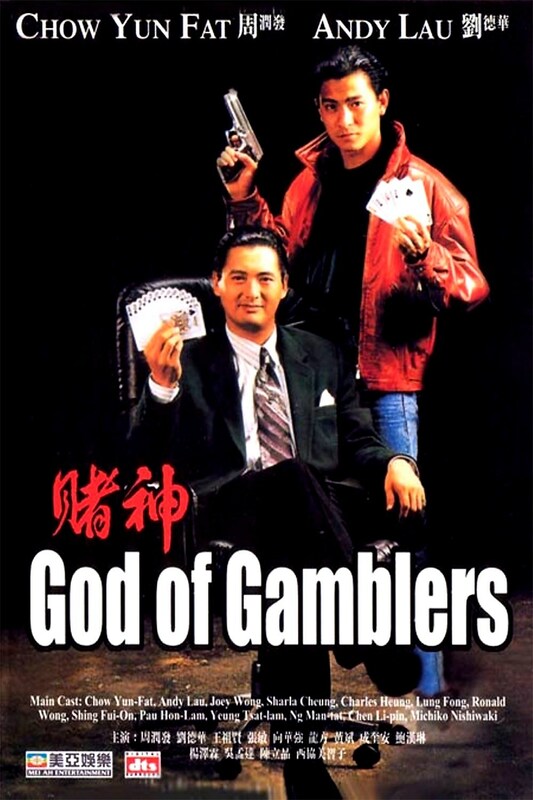 In the half decade between God Of Gambers (1989) and this sequel a number of spin-offs and sub-franchises kept the burgeoning gambling genre alive. Chow Yun-Fat, now a veritable HK action star thanks to his work with John Woo, returned to his iconic role as Ko Chun. God Of Gamblers Return is everything that the first movie was but bigger in every sense of the word. Tightly directed, beautifully photographed and with a cast including, among others, Tony Leung, Chingmy Yau, Elvis Tsui and Ng Sin-Lin God Of Gamblers Return is one of those rare sequels that is actually better than the original film. The action is hard-hitting, the jokes work, and the women are uniformly beautiful. 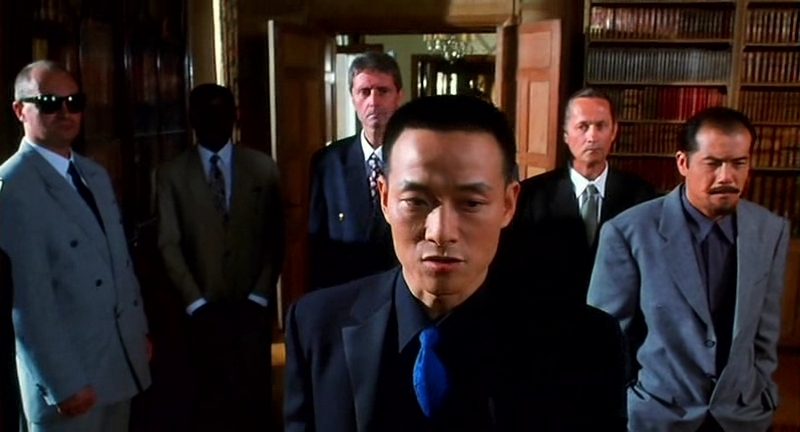 In God Of Gamblers Return everthing works and it’s free of Wong’s more annoying tendencies. No wonder it passed the HK$ 50 million (HK52,541,028) mark at the HK box office. 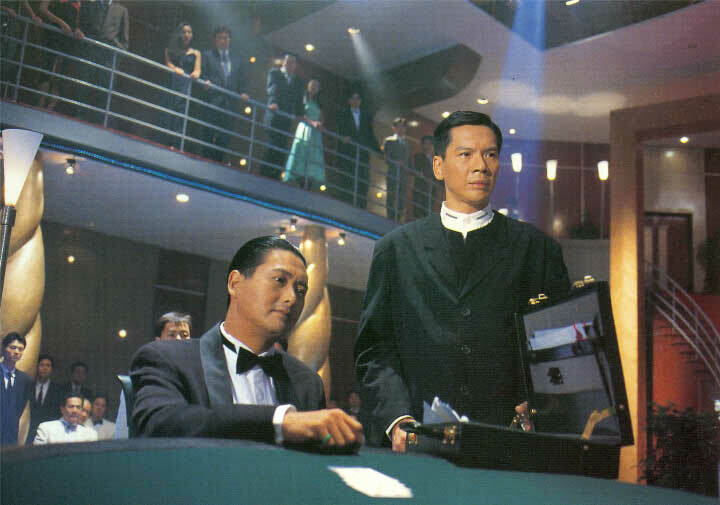 God Of Gamblers (1989) established gambling as a genre of its own. 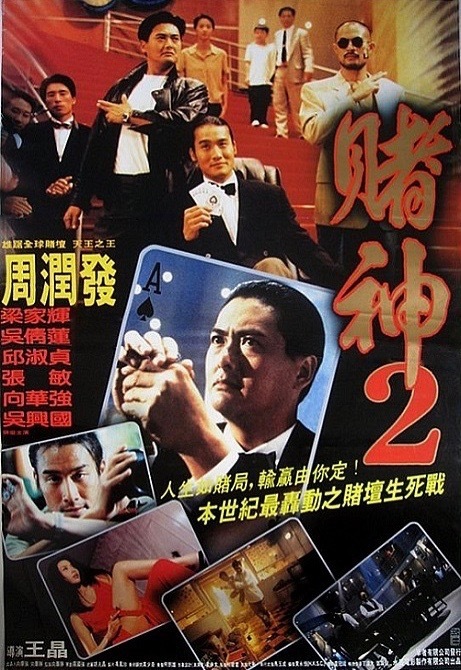 An official sequel not immediately forthcoming Jing Wong (and others) capitalized on the movie’s box office success with All For the Winner (1990) and Casino Tycoon (1992). All For the Winner spoofed God Of Gambers but was succesfull enough to become its own franchise. 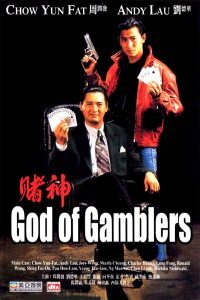 God Of Gamblers II (1990) acted both a sequel to the Chow Yun-Fat original and as a pseudo-sequel to the earlier All For the Winner (1990). All For the Winner (1990) was headlined by rising star Stephen Chow and The Top Bet (1991) installed Carol Cheng Yu-Ling and Anita Mui as the star gamblers. For maximum possible confusion Cheng Yu-Ling starred in The Queen of Gamble (1991). 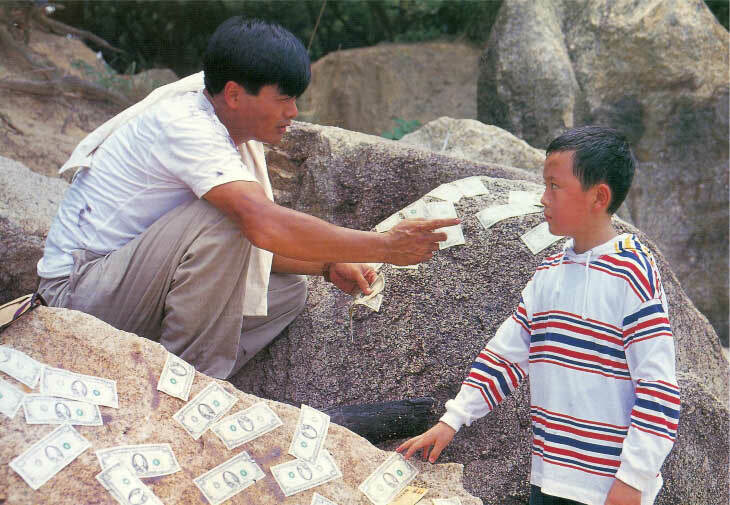 God of Gamblers III: Back to Shanghai (1991) took an everything-and-the-kitchen-sink approach and is probably the craziest of the Stephen Chow sub-franchise. It wasn’t until 1994 that Wong produced an official sequel to his earlier smash hit. Evidently God Of Gamblers Return was worth the wait. It has been 5 long years since Ko Chun, the God Of Gambers (Chow Yun-Fat) has made any public appearances. In his absence his apprentice Little Knife has since become a reputable gambler of great renown. For four years Chun has lived in great anonimity in France where he picked up painting. Since a year he’s back at home and living a quiet life on his opulent estate with his pregnant second wife Wan Yau (Sharla Cheung, as Man Cheung), a spitting image of his first spouse. His friend Lung Ng (Charles Heung Wah-Keung) comes over for a visit and the two engage in a friendly shooting match in the gardens of the estate. Suddenly a convoy of black limos arrive at the estate disgorging the number one contender to Ko Chun’s title, Chau Siu Chue (Wu Hsing-Guo). Ko Chun’s wife Wan Yau is brutally shot, gutted and his unborn son is torn from the womb and kept in a jar. All mere preamble to coerce Ko Chun into a gambling duel in Taiwan. Yau forbids Chun to gamble and reveal his identity for a year as to not plunge him into an impulsive act of retribution. As Yau passes away in his arms Ko Chun promises to honor her dying wish. For the next 11 months Chun travels the world as a shadow, avoiding most human contact and never having his picture taken. He arrives in Mainland China where dazzling beautiful young girl Hoi Tong (Chingmy Yau Suk-Ching) catches his eye when taking a picture. Before long he’s making his acquaintance with her precocious little brother Hoi Yuen (Xie Miao) and their gangster father Hoi On (Blacky Ko Sau-Leung, as Blackie Ko). A power struggle within the criminal organisation that Hoi On works for has ambitious underling Tao Kwun (Ken Lo Wai-Kwong) violently attacking the boat on Qingdao lake that Ko Chun and his new friends are on. In his dying breath Hoi On entrusts Ko Chun with the care of his children. As they wash ashore in Mainland China they are immediately arrested and detained by the communist People's Armed Police under command of Capt. Kok Ching Chung (Elvis Tsui Kam-Kong) and his high-maintenance wife (Bonnie Fu Yuk-Jing). Thanks to some quick thinking Ko Chun and Hoi Yuen escape imprisonment, but their daring escape leads to a massive hard-target manhunt of the two fugitive felons. The duo seek shelter in a nearby low-rent motel where they meet grifter sibling duo Siu Fong-Fong or Little Trumpet (Tony Leung Ka-Fai) and his younger sister Siu Yiu-Yiu, or Little Guitar (Ng Sin-Lin, as Chien-Lien Wu) who is terrible as a hostess and even worse as a waitress but harbors a crush on the God Of Gamblers, of whom she possesses a picture. The People's Armed Police eventually surround the motel where Hoi Yuen has defeated the grifters at Black Jack. The police assault to building razing it to the ground in the process and the gang gets away by pretending to be police officers and taking commander Bo hostage. The four charter a boat to Tainam, Taiwan as command of the police forces is taken over by Cheung Po Sing (Wong Kam-Kong), a mentalist who refers to himself as the Treasure of Mainland. The gang arrive in Taiwan with only three days to spare. En route to the Taiwanese casino Ko Chun and the gang reconnect with Hoi Tong, who makes a spectacular entrance in the establishment. Bound to keep his identity secret Ko Chun pretends to be Little Knife, the apprentice of the God Of Gamblers with Little Trumpet taking on Ko Chun’s identity. Chan Gam Sing (Bau Hon-Lam), Cho’s opponent from the first film, warns the God Of Gamblers that Chau Siu Chue will stop at nothing to defeat him. Chau Siu Chue’s forces storm the casino and in the ensuing fracas Little Guitar takes a bullet but not before realizing that she spent her dying moments (and the days before) in company of her biggest idol. Sworn to avenge the slayings of Little Guitar and his wife Wan Yau, Ko Chun faces off against Chau Siu Chue, the self-proclaimed Devil Of Gamblers, in a match of Chinese poker. There couldn’t be a bigger difference between this movie and the first. God Of Gamblers for the most part was a situational – and slapstick comedy bookended by high-stake gambling segments from whence it derived its name. God Of Gamblers Return on the other hand makes full use of Yun-Fat’s new status as HK action star. The many bullet ballet action scenes are redolent of John Woo, be it that they only miss the characteristic long trenchcoats and cool sunglasses. The comedy now is merely limited to moments in between dramatic character scenes, violent shoot-outs, and the thing everybody’s here for: the gambling matches. Chow Yun-Fat obviously relished in returning to one of his most famous characters, and whether he’s playing the suave, worldly gambler or the scruffy looking every guy in his civilian identity Yun-Fat shines. Tony Leung’s Little Trumpet is an obvious substitute for Andy Lau’s Little Knife (who starred in his own gambling franchise with All For the Winner) and the chemistry between Yun-Fat, Leung and Ng Sin-Lin is one of the movie’s greatest accomplishments. Jing Wong never hid his adoration for Chingmy Yau, and who in the right mind could possibly blame him? In 1994 Yau was a HK superstar thanks to her appearances in Naked Killer (1992), Future Cops (1993), the wuxia spoof Legend of the Liquid Sword (1993), the failed franchise launcher Kung Fu Cult Master (1993) with Jet Li and City Hunter (1993) with Jackie Chan and Joey Wong. It’s common knowledge that Wong and Yau had an affair for many years prior to Chingmy’s marriage in 1999. No other woman in the cast, not even the considerably higher profile Sharla Cheung, gets as many flattering shots and the most beautiful dresses to wear as Yau gets here. 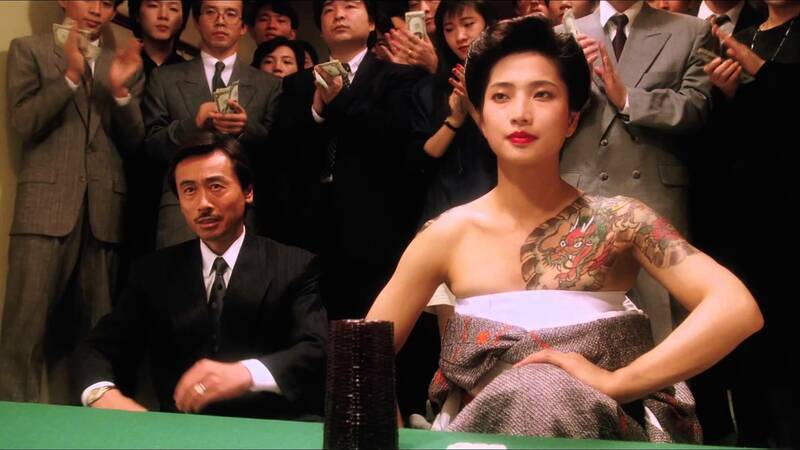 The scene where Hoi Tong makes her entrance in the Taiwan casino and cuts the cards for the goons is legendary for all the right reasons. Yau gets to show some leg and partake in an impressive bout wire-fu stuntwork in a sequence that borrows equally from his earlier Naked Killer (1992) and Future Cops (1993), respectively. No matter what role Wong cast Yau in she always was sure to steam up whatever scenes she was in even if the movie itself was a dud. Like many a popular Hong Kong property the God Of Gamblers franchise has a confusing history with sub-franchises, spin-offs, and regular sequels following its initial box office success. What counts as canon largely depends on one’s personal preference as most movies in the franchise share the same talent and themes, but largely exist in their own continuities, an exception or two notwithstanding. Chow Yun-Fat, Andy Lau, and Stephen Chow at various points headline the proceedings, but the deeper one gets into the series (recurring roles for Ng Man-Tat and Sharla Cheung, among others, often as different characters from one installment to the next, don’t help either) the harder it becomes to make sense of the timelines and continuity. Some of ‘em are funnier, some of ‘em are not. Some have Jing Wong directing, others do not. What does remain a constant is that the God Of Gamblers franchise is filled with action, comedy, strikingly beautiful women and exciting high-stakes gambling matches against a variety of colorful opponents. 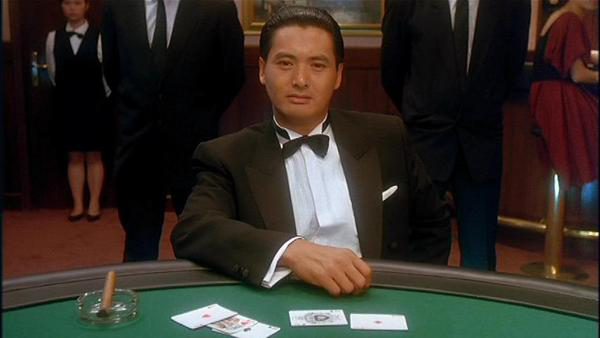 Ko Chun (Chow Yun-Fat) is a secretive black-tie gambler blessed with the uncanny ability to win high-stakes games even when the odds are seemingly stacked against him. For that reason he is known only as the God Of Gamblers. Ko Chun has a beautiful wife in Janet (Sharla Cheung, as Man Cheung) and lives a quiet life when he's not gambling. He also is a fanatic and connoisseur of preeminent chocolate and won’t settle for any less. Ko Chun’s Japanese acquaintance Mr. Wang (Luk Chuen) requests his services for a high-stakes mahjong game against nefarious loanshark Shing (Ng Man-Tat). He, of course, agrees to help his friend to even his incurred debt. Ko Chun faces Shing and his partner miss Shi (Michiko Nishiwaki) – who, judging by her set of tattoos, is involved with the Triads - and defeats them against impossible odds. Dishonored by their loss at the mahjong game the Triads send a gang of assassins to murder Ko Chun. For protection Wang sets him up with security detail Lung Ng or Dragon (Charles Heung Wah-Keung), but he’s unable to ward off the many assailants swarming Ko Chun. Meanwhile small-time crook Michael Chan, who calls himself Little Knife (Andy Lau) on the streets, has set up a practical joke for a neighbour. Little Knife lives in the New Territories in a small house down at the waterline with his mother (Chan Lap-Ban), his girlfriend Jane (Joey Wong) and his friend Crawl (Ronald Wong). In getting away from a swarm of Triad assailants Ko Chun runs into Little Knife’s trap and crashes down a hill injuring his head. Little Knife and his friends find Ko Chun and decide to rob him now that he’s in a helpless state. To make ends meet Jane works as a hostess in a nightclub in the big city. Little Knife has a change of heart, mostly due to Jane’s intervening, and instead takes Ko Chun into the house, and nurse him back to health. Rendered amnesiac due to his head trauma Ko Chun has no recollection of his former identity, and has regressed to an infantile state – but has retained both his masterful gambling skills and his incredible love for chocolate. Thus, in lieu of actually knowing that Ko Chun is the God Of Gamblers, they dub him Chocolate. Little Knife decides to have Chocolate checked up by Dr. Toneg Wong (Dennis Chan) just to be safe. In the interim they use Chocolate for their own personal enrichment, but Ko Chun’s former gambling associates want to coerce him into playing one final high-stakes match against revered elderly Singaporean industry legend Chan Gam Sing (Bau Hon-Lam). The titular star of the God Of Gamblers is Chow Yun-Fat, who at this point was mostly known as an actor in dramatic and romantic pieces as Love in a Fallen City (1984). Yun-Fat had finished a stint in the heroic bloodshed genre working with directors John Woo and Ringo Lam on HK action classics as A Better Tomorrow (1986), City on Fire (1987), Prison on Fire (1987) and A Better Tomorrow 2 (1987). For the romance An Autumn's Tale (1987) Yun-Fat won the Golden Horse Award for best actor. God Of Gamblers allowed Chow Yun-Fat to showcase his versatility as an actor as it combined all of the previous genres he had dabbled in. Jing Wong’s gambling movie broke Hong Kong's all-time box office records establishing gambling as a veritable genre. God Of Gamblers was the first high-profile appearance of Joey Wong after her star-making turn in Tsui Hark’s tragically romantic fantasy wuxia A Chinese Ghost Story (1987). Wong gets a few bars of Burt Bacharach’s ‘Raindrops Keep Fallin’ On My Head’ as a theme, to establish her character’s good nature and overall innocence. When we first see Wong she’s wearing a casual shirt and ripped denims, later she can be seen wearing a very flattering figure-fitting verdant corset-dress that accentuates her athletic build. Sharla Cheung had been in Wong’s The Magic Crystal (1986) and would feature in Royal Tramp (1992) and its sequel, Kung Fu Cult Master (1993), The Sword Stained with Royal Blood (1993) and Dragon Chronicles - The Maidens Of Heavenly Mountains (1994). Most, if not all, the comedy is derived from Chow Yun-Fat’s Ko Chun regressing back to an infantile state after his head injury. His child-like antics, and the lenghts to which the gang have to go to provide their card-playing wünderkind with a steady stream of chocolate, do give Yun-Fat the possibility to show his range as an actor. At one point Little Knife is chased by Triad goons across bamboo scaffolding which is pretty funny. 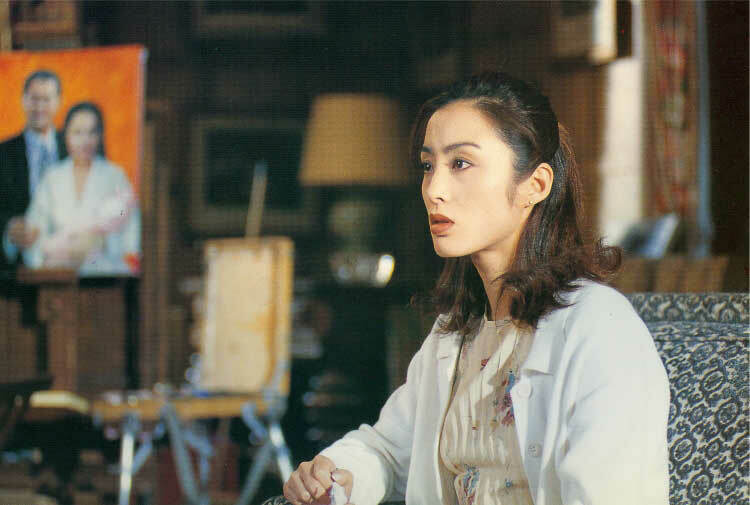 Ng Man-Tat excels as the lecherous Triad loanshark and Michiko Nishiwaki does most of her acting with mere glances during the opening mahjong game. Joey Wong, having played a good amount of spectral maidens by this point, is allowed to do something else than constantly looking misty-eyed and pouting. As Jane she usually acts as the gang’s voice of reason and conscious – and Little Knife only comes around until Jane tells him to. Sharla Cheung’s Janet is pretty much a supporting character and her involvement in the plot is minimal as such. Once Jane is reunited with Ko Chun at the end of the third act there’s a wonderful sense of chemistry between her and Chow Yun-Fat. Jing Wong always had an eye for beauty and Strawberry Yeung Yuk-Mui, who plays a card-dealing waitress at one of the games later in the movie, is no exception to the rule. Depending on your tolerance for situational – and slapstick comedy shenanigans God Of Gamblers is one of those cross-genre exercise that could only have come from Jing Wong. When Wong’s on fire he hits the marks more often than not. When he doesn’t something as nigh on incoherent as Future Cops (1993) is usually in the cards. In the interim Andy Lau and Stephen Chow were given their own sub-franchises and The Top Bet (1991) installed Carol Cheng Yu-Ling and Anita Mui as the star gamblers. It wouldn’t be until 1994 that Wong produced an official sequel to his earlier smash hit. For reasons that remain largely oblique God Of Gamblers and its belated official sequel never quite catched on in the Western hemisphere despite pushing all the right buttons. Chow Yun-Fat, now a superstar in his native Hong Kong, would eventually conquer Europe and America with the award-winning Ang Lee period costume wuxia Crouching Tiger, Hidden Dragon (2000) with former Girls with Guns action star Michelle Yeoh and Zhang Ziyi. In 1989 Chow Yun-Fat was just starting to find his footing in Hong Kong genre cinema.